New Independent Driving Test Explained! During October 2010, the Driver and Vehicle Standards Agency (DVSA) introduced the independent driving element to the UK practical driving test. The independent part of the driving test to enable the examiner to assess the candidates ability to drive independently, using road markings and road signs and with little input from the examiner.With the update of the 2017 driving test changes, the independent part has now increased from 10 minutes, to 20 minutes which is around half of the entire time the test takes to conduct. Another new addition to independent driving is the inclusion of following directions from a sat nav. This section explains what happens during the independent part of the driving test, plus tips for completing it successfully. What Is The Independent Driving Test! From the 40 minutes duration of the practical driving test, 20 minutes are assigned for independent driving. During the drive, the examiner will ask you to park up on the left when it’s safe to do so and they will proceed to tell you that the independent driving part will begin. You can get a complete rundown on the test by reading the what to expect on the driving test guide. From every 5 driving tests conducted, 4 tests will involve following directions from a sat nav during independent driving. You don’t need to worry about taking along your own sat nav, or operating the built-in sat nav in your car as examiners will take their own device. The sat nav that examiners use is a TomTom Start 52, which will be mounted on a Genius flat dash-mat. The sat nav will use an in-built battery as a power source, so there’s no need for the examiner to plug in cables to your vehicle. The test candidate will not operate the device as the examiner will setup the route on the sat nav – you’ll just need to follow directions. You’ll not be given the option to use your own sat nav device. Alternatively, if your driving test doesn’t involve the use of a sat nav, you’ll instead be required to follow road signs for the independent driving section. Independent driving routes where road signs are to be used will be clearly visible for test candidates. However, if you cannot see a road traffic sign (this could be because it’s covered by trees for example), the examiner will provide direction until the next sign is visible. In the case for following road signs, the examiner will state they would like you to follow the road signs to a specific location, they will then update you accordingly. If you are a little unsure of where you should be going, ask the examiner to repeat instructions. There are no rules that you need to abide by for independent driving. In fact, you don’t even need to worry about following directions or signs correctly. Of course try your best to keep to the correct routes and directions, but the main purpose of the independent driving section is to demonstrate that you can remain safe and calm whilst driving unaided. Whether it’s following a sat nav or road signs, the most experienced of drivers take a wrong turn sometimes. If this happens during the test, don’t stress as the sat nav will recalculate the route for you and put you back on track. If your test involves following road signs and you make a wrong turn, the examiner will assist you and put you back on route. During the independent driving section, you will not fail for making a wrong turn, but you may fail if you become excessively stressed and panic to the extent that your driving becomes affected. If you make a mistake, try to remain calm, but if you do become stressed, explain to the examiner that you need to pull over for a moment. Ensure that you choose a safe, convenient and legal position (SCALP) if you do so. An experienced local driving instructor can offer valuable practice for the independent driving section. They will know the sat nav routes and the road sign routes that the examiners use and will provide practice on both. The instructor will fully explain what is involved for independent driving and will initially provide verbal assistance for both the sat nav and road sign versions. As you gain in experience and confidence, the instructor will use much less verbal interaction so to replicate the real independent driving section. If you are not entirely sure of the directions you need to take, ask the examiner for assistance. This is of course intended to be ‘independent’ so help from the examiner may be limited. It makes no difference to the result of the driving test if you make incorrect turns during the independent driving providing you do so safely. If you feel that you are becoming excessively stressed (at any point during the driving test not just independent driving) pull over in a safe, legal and convenient location to take a few moments to compose yourself. All DVSA examiners will use the Tom Tom Start 52 model sat nav during the test. This device is very adaptable and the examiner is able to change the color, contrast and volume to ensure it is suitable for all test candidates. 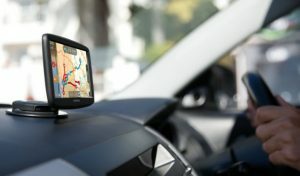 The setup of the sat nav will in general be ‘default’ as it is the preferable setting used for most users, but if a test candidate needs the layout changed on the device, the instructor must contact their Local Driving Test Manager before the test to discuss personalized settings required for the test candidate. On agreement, the manager will confirm this in writing and this should be taken and shown to the examiner on the day of the test.